One day after being left for dead in a trash pile behind a Philadelphia rec center, Charlie gets belly rubs from Nikki Rubino at Philadelphia Animal Hospital. Charlie is doing better, but he still has a long way to go. That was the Saturday afternoon word from Dr. Lawrence A. Rebbecchi at Philadelphia Animal Hospital in Southwest Philadelphia. 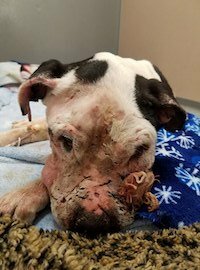 Rebbecchi has been treating the 2-year-old pitbull mix since he was discovered after being left for dead in a pile of trash outside the Cobbs Creek Recreation Center on Tuesday. 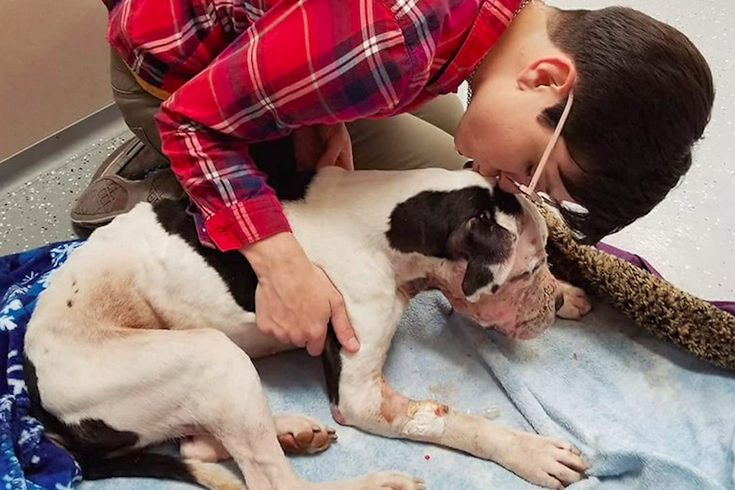 It was a horrifying discovery prompted a community to band together to support Charlie, who was apparently used as a bait dog by those training dogs to fight. Rebbecchi told PhillyVoice that Charlie has improved from those perilous early hours. Of primary concern for Rebbecchi is a bacterial infection getting into the bloodstream and leading to sepsis. The infection was prompted by maggots getting into open cuts and lesions as he sat in the trash near a Dumpster outside the South 63rd Street facility for an unknown period of time. Tissue is so deteriorated that there are fears that the dog could ultimately lose part of his face. Bandages cover the side of Charlie's face that suffered the most damage. Nikki Rubino rescued Charlie from that trash heap along with her roommate Rob Rossi. She’s been to visit him several times now and said she’s seen some promising signs. “I saw him (Friday) and he was awake and eating small, soft treats,” she said. “He still needs more surgeries and as a lot of healing to do. Charlie’s story prompted an outpouring from West Philadelphia and beyond to the point where Rebbecchi said people are calling with offers of donations, which he is not accepting. Instead, donations are donations going to City of Elderly Love: Save a Senior Pet instead.